I still remember my debut TED experience. It was 2009, the first year that the global conference had begun its Fellows programme, and I was one of the lucky few selected. This was also the first time that the conference was being held in India. Sitting in the humungous Infosys Mysore auditorium, surrrounded by my amazing group of other TED Fellows like digital innovator Rikin Gandhi, Olympic sailor Rohini Rau, the Ambulance Access for All founder Shaffi Mather and the youngest school headmaster in the world, 24-year-old Babar Ali, my mind exploded with ideas and possibilities. Together, we heard stories of micro-revolutions from each other, as well as from the main stage speakers that we became instant fans of, like Anupam Mishra, with his deep knowledge of India’s history, or Sunitha Krishnan and her fierce bravery and commitment to creating a more equal world for India’s young girls. It was TED India that sowed the seeds of cross-pollination in my mind. My work since then has been all about dot-connecting. However, after the initial enthusiasm of being a TEDster, life took over and though I managed to attend the offshoot INK regularly ever since it began in 2010, and even hosted some of the early TEDx events in India, I never made it back to the main arena. Flash-forward to 2017. 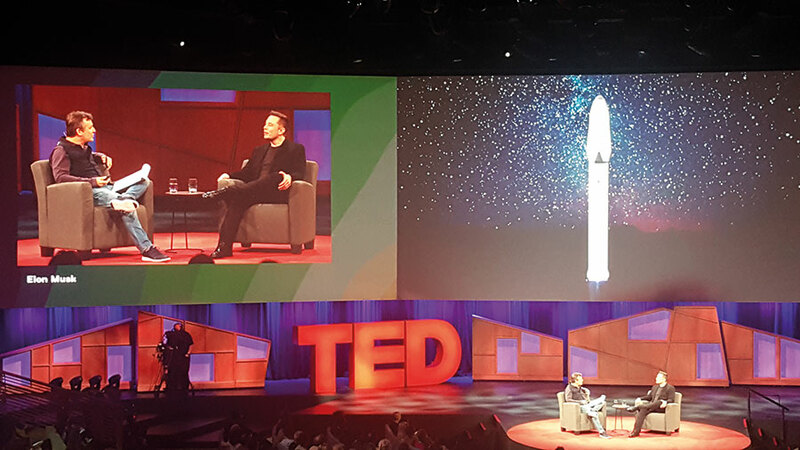 The TED conference has shifted from California to Canada and the empire has expanded into several different initiatives — an annual million-dollar prize, the celebrated TED website with videos that have had more than two billion views and an institute, to name just three. Our TED Fellows programme has also grown from its fledgling days. There are now 414 Fellows from 87 countries, whose talks have collectively been viewed more than 145 million times. But the main news is that I have finally returned to the fold after being selected as a Senior Fellow. After spending a week in Vancouver, I felt like I had never been away from the community. As always, new ideas abounded at the summit. There was fascinating tech on display. A typical morning had a dog-shaped robot from Google-owned Boston Dynamics casually roaming the conference centre while outside, the UK scientist Richard Browning gave a fun demo of his Iron Man-style personal flying suit. (I checked if they were open for pre-orders, but there’s still some time for that. They will be so good for Mumbai traffic, no? Just fly over it all.) Then there was the real-life Tony Stark himself — the supersexy Elon Musk talking about digging tunnels under LA (he’s called that venture The Boring Company, ha!) and rockets that will take us to Mars, but my mind was completely somewhere else. Damn you, Amber Heard! I must confess, she is stunning. Sigh. Moving on…. There were a lot of talks on climate change and geoengineering, algorithms and AI and putting our cell phones down. As if. My favourite speaker was the Nobel Prize-winning biologist Elizabeth Blackburn who spoke about how we can control our telomeres — the tiny areas located at the tips of our chromosomes that determine how fast we age and die. I loved when she spoke about how this was not about achieving immortality, but managing our health span (“The number of years that we are free of disease and able to do things”) better. We are all dealt a particular set of gene cards, Dr. Blackburn pointed out, but managing our diet, exercise levels and stress can help us control our telomeres and thereby our health. Sensible advice. It was also an honour to meet psychotherapist Esther Perel whose reimagination of modern relationships has changed my thinking certainly. Watch her talk on rethinking infidelity on the TED website. It is eye-opening. It soon became normal over the course of the five days to queue up next to Al Gore while waiting to get into a session, or have breakfast each morning with space archaeologist Sarah Parcak, a modern-day Indiana Jones, who uses satellites orbiting hundreds of miles above our planet to discover ancient treasures located below the ground. Sarah told me that that we have only excavated less than a thousandth of one per cent of our ancient ruins. She won the million-dollar TED prize last year and has just launched her online platform called GlobalXplorer to crowdsource satellite-based archaeology. Amplifying voices of the unheard is something that the award-winning author Anjan Sundaram has now been doing for years. I shared a beautiful bus ride to a pre-conference Fellows cooking session with him. Anjan has written two powerful books about his experiences as a journalist in Africa — Stringer: A Reporter’s Journey in the Congo and Bad News: Last Journalists in a Dictatorship. He told me about his recent reportage in Rwanda; about how the government there was suppressing freedom of speech and simply creating an illusion of progress. In situations such as these, as with other African countries he has worked in, it is so important to bear witness to the true stories of ordinary people, and not follow the official line that is doled out. Anjan said, “The ignored people in all our communities tell us something important about who we are.” All we have to do is listen. Sage advice even for us in India! Hanging out with Anjan filled my heart with desi pride, as did chatting with the Indian-origin Harvard Medical School instructor and Ebola warrior Raj Panjabi who won the TED prize this year for his wish to “recruit the largest army of community health workers the world has ever known, by creating the Community Health Academy, a global platform to train, empower and connect.” Healthcare workers that Raj trained through his Last Mile Health organisation helped control the Ebola outbreak of 2014, and now Raj plans to save 30 million lives by 2030 with the funding that the TED prize will bring him. From one heroic Raj to another. Our own Shah Rukh Khan was his usual funny, self-deprecating, self-absorbed self on the TED stage, and he had the audience eating out of his hands with his one-liners like: “Humanity is a lot like me — an ageing movie star, grappling with all the newness, wondering whether he got it right.” I am particularly excited about Shah Rukh’s upcoming TED show on Star Plus called TED Talks India: Nayi Soch. This is the first time TED is collaborating with a major network to produce a TV series featuring original TED Talks in Hindi — and hopefully the show’s telecast will help spur more innovations from our country. There were so many smart people of colour all around me in Vancouver that it felt like I hadn’t left Vikhroli at all! It was lovely to connect with the adorable Ramesh Raskar, who holds 75 patents and is the winner of the Lemelson-MIT prize. Ramesh is hacking his way to a better India with the different MIT projects he is heading around peer-to-peer innovation in Nashik. It was also good to eat desi snacks each evening — the palak pakodas served at TED were better than any I’ve had in India. Vancouver is such a beautiful city, with the mountains on one side and the sea on another. When I visited Queen Elizabeth Park one sun-kissed afternoon, the tulips were in full bloom. So Silsila, I thought immediately. 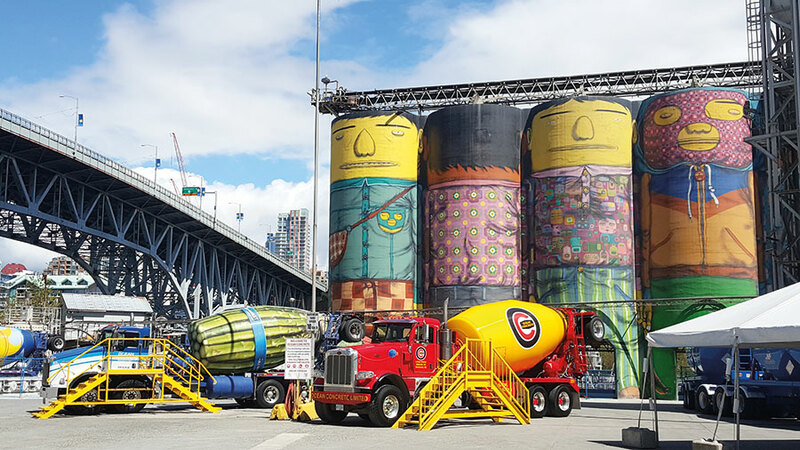 I also loved the arty vibe and industrial chic of Granville Island, and the beautiful collections of First Nations art at the University of British Columbia’s Museum of Anthropology. ‘First Nations’ is the term that is now used for the predominant indigenous aboriginal people of Canada who lived on the land for many thousands of years before the European colonisers arrived. The terms used previously were ‘Indian’ or ‘Native Canadian’ but these are not considered appropriate now. First Nations people identify themselves by the nation to which they belong, for example, Mohawk, Cree, Oneida, and so on. I was lucky that my visit coincided with a major career retrospective of Susan Point at the Vancouver Art Gallery. Point is a celebrated Musqueam First Nations artist who has spent her lifetime working on coastal Salish art. Her works, ranging from sculpture to prints, are often based around the motif of the spindle whorl — is a tool that comprises a wooden disk with a pole inserted through the centre — that was traditionally used by Coast Salish women to prepare wool that would be woven into garments and ceremonial blankets. I was mesmerised by how a simple motif like a spindle whorl could branch out into so many different artistic directions over a lifetime. I also discovered the works of Bill Reid through the eponymous gallery dedicated to him. Reid, a Haida First Nations artist, was a master goldsmith, carver, sculptor, poet and teacher. He created over 1,500 works over his lifetime. I was particularly moved by the different iterations of a sculpture he had carved repeatedly over the years. 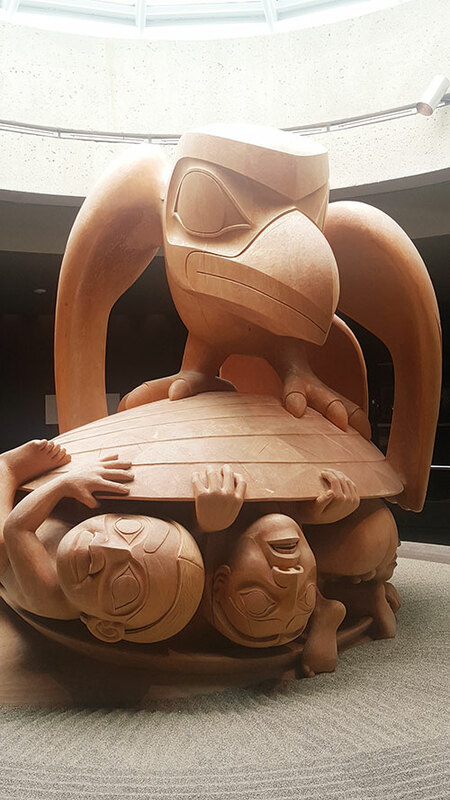 Titled The Raven and the First Men and derived from a Haida tale about the birth of mankind, I saw versions in gold, marble and wood, and each of these was breathtaking.